Child protection conferences will be called for all children who have been the subject of a child protection investigation for whom there remains suspicions that the child has suffered or is at risk of suffering significant harm, and there remain unresolved child protection issues. An initial case conference will consider not only the needs of the child of enquiry but also of the needs of other children in the household and any risk or welfare issue applicable to them. The initial child protection case conference brings together family members, the child (where appropriate) and those professionals most involved with the child and family, such as teachers, health visitors, social workers and the police. What will happen at the conference? Agree a child protection outline plan and its intended outcome. If you would like to discuss any aspect of case conferences or social services involvement, please call Mark or Lauren on 01242 517949, 01792 892692 or 01993 220651. 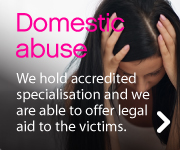 Alternatively, please email us at enquiries@ds-legal.co.uk. We’re here to help.